"For God, for country, and for Yale... in that order," William F. Buckley Jr. wrote as the dedication of his monumental work—a compendium of knowledge that still resonates within the halls of the Ivy League university that tried to cover up its political and religious bias. In 1951, a twenty-five-year-old Yale graduate published his first book, which exposed the "extraordinarily irresponsible educational attitude" that prevailed at his alma mater. 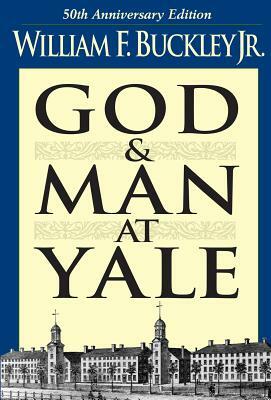 The book, God and Man at Yale, rocked the academic world and catapulted its young author, William F. Buckley Jr. into the public spotlight. Now, half a century later, read the extraordinary work that began the modern conservative movement. Buckley's harsh assessment of his alma mater divulged the reality behind the institution's wholly secular education, even within the religion department and divinity school. Unabashed, one former Yale student details the importance of Christianity and heralds the modern conservative movement in his preeminent tell-all, God and Man at Yale: The Superstitions of "Academic Freedom." William F. Buckley Jr., who founded National Review magazine in 1955, is the author of more than forty books. For more than thirty years he hosted the television show Firing Line, and his newspaper column, "On the Right," is syndicated to more than three hundred newspapers.